In this March 24, 2018, file photo, moderator Chris Hardwick speaks onstage during AMC's 'Fear of the Walking Dead' panel at WonderCon at Anaheim Convention Center in Anaheim, California. AMC announced on Saturday that it will not air Chris Hardwick's show Talking With Chris Hardwick amid his ex-girlfriend Chloe Dykstra's allegations of sexual assault and emotional abuse, which he has denied. The second season of the series was supposed to premiere on Sunday. On Friday, Dykstra, 29, posted a Medium essay about how she underwent "emotional abuse" by a man she was in a relationship with and also wrote that she "let him sexually assault" her "regularly" during their time together. "We have had a positive working relationship with Chris Hardwick for many years," AMC said in a statement to E! News. "We take the troubling allegations that surfaced yesterday very seriously. While we assess the situation, Talking with Chris Hardwick will not air on AMC." The cable network also said, "Chris has decided to step aside from moderating planned AMC and BBC America panels at Comic-Con International in San Diego next month." The 49-year-old TV personality, also known for hosting AMC's Talking Dead and for founding the Nerdist podcast and company, has not responded to the statement. In addition, KAABOO Del Mar Festival organizers announced that Hardwick has been pulled from the lineup of the 2018 Humor Me comedy show. While Dykstra did not name Hardwick in her post, her description of her ex spurred readers to conclude she was talking about him. Several hours later, after his name trended on Twitter, Hardwick said in a statement that he was "blindsided" by her post and that the conduct she accused him of did not occur. "These are very serious allegations and not to be taken lightly which is why I've taken the day to consider how to respond," Hardwick said in a statement to Deadline on Friday night. "I was heartbroken to read Chloe's post. Our three-year relationship was not perfect--we were ultimately not a good match and argued--even shouted at each other--but I loved her, and did my best to uplift and support her as a partner and companion in any way and at no time did I sexually assault her." In her essay, Dykstra wrote that "after three years of being snapped/yelled at constantly, very rarely being shown any affection," she left Hardwick for another man that she "had literally just met," adding, "Unfortunately, there was a slight crossover: a kiss. A kiss I immediately told him about, and he, surprisingly, instantly forgave me." "When we were living together, I found out that Chloe had cheated on me, and I ended the relationship," Hardwick said in his statement. "For several weeks after we broke up, she asked to get back together with me and even told me she wanted to have kids with me, 'build a life' with me and told me that I was 'the one,' but I did not want to be with someone who was unfaithful." "I'm devastated to read that she is now accusing me of conduct that did not occur," he said. "l was blindsided by her post and always wanted the best for her. As a husband, a son, and future father, I do not condone any kind of mistreatment of women." Hardwick and Dykstra dated for three years until 2014. He has been married to Lydia Hearst for almost two years. She has not commented on Dykstra's remarks. Hardwick made his statement hours after Deadline reported that reps of celebrities who were interviewed on Talking With Chris Hardwick had told AMC that "they are now 'very uncomfortable' with the association with Hardwick in the #MeToo and Time's Up era of Hollywood" and that some "are pressuring to have the debut postponed until the claims against Hardwick are thoroughly investigated." 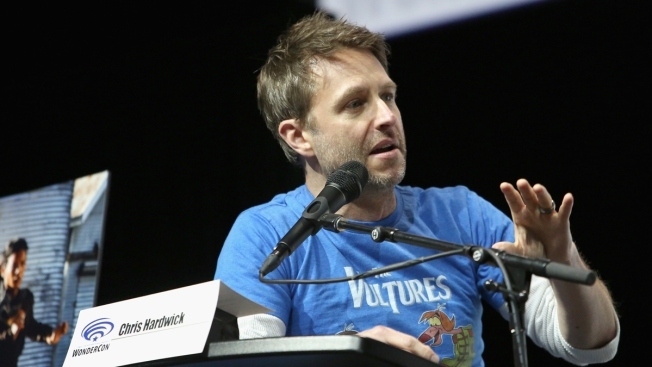 Hardwick also made his comments hours after all references to him were removed from the Nerdist website. "Chris Hardwick had no operational involvement with Nerdist for the two years preceding the expiration of his contract in December 2017. He no longer has any affiliation with Legendary Digital Networks. The company has removed all reference to Mr. Hardwick even as the original Founder of Nerdist pending further investigation," a Legendary spokesperson told The Hollywood Reporter on Friday. "Before I take my break, I do want to address something re: the company he founded," Dykstra tweeted. "As I understand it, the person has not been associated with that company for several years, and I hope that they will not suffer as a result of my essay. Be kind to them, they are good people."